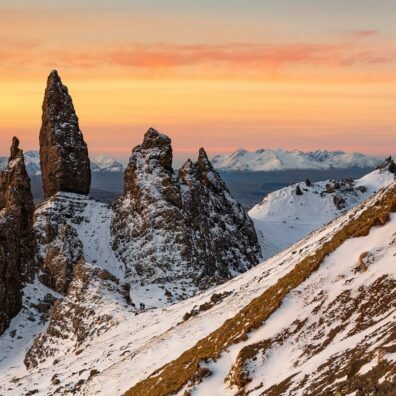 The Isle of Skye in Scotland is the perfect place to run a landscape photography workshop as it offers the most dramatic scenery anywhere in the UK. The island is connected to mainland Britain via a road bridge and is only fifty miles in length and twenty-five miles in width and has a population of just 10,000 people. It is the UK’s fourth largest island behind mainland Britain, Ireland and Harris and Lewis in the Outer Hebrides. The wonderfully mysterious fishing harbour of Elgol, from which the dominant and sometimes menacing Black Cuillin mountain range that stands before you complete with eleven munroe’s that top out at over 3,000ft each, offers an atmospheric feel to your images. The Fairy Pool waterfalls and Glen Brittle river which are truly unique with its aqua coloured water, plunge pools and an underwater arch is perhaps Skye’s most popular location and on seeing it for yourself, you understand why. The wonderful old road bridge of Sligachan and the river below it complete with the Red Cuillin as an impressive backdrop which glow vibrant orange during a stunning sunset is to be experienced and onto one of my favourite locations, Neist Point Lighthouse which stands high up on the edge of a cliff on the most westerly point of the island which also allows for some spectacular sunsets to be captured here. The Isle of Skye has earned itself an enviable reputation for delivering spectacular scenery in dramatic weather. I love the Isle of Skye and you will too. Come and join me for an inspiring experience of a lifetime.